Watches are classy, high-quality jewelry appropriate for both sexes. It’s no wonder folks give them out for important events such as milestone birthdays or retirement. The face of the watch can last for generations, being past down over and over again. However, what good are the mechanics without a means to affix them to your person? Enter Straps Company. With the help of OC Designs Online they are now able to effectively penetrate their very niche market. Their easy to navigate eBay Store Design helps them to sell more than ever before and help family heirlooms stay in circulation. The clean header encompasses the creative logo and navigation bar inviting shoppers to visit tabs to view the entire product selection, search customer feedback or review shipping and return policies. Below a clever graphic alerts customers to key store policies including free and fast shipping, hassle free returns and promises of premium quality on all merchandise. 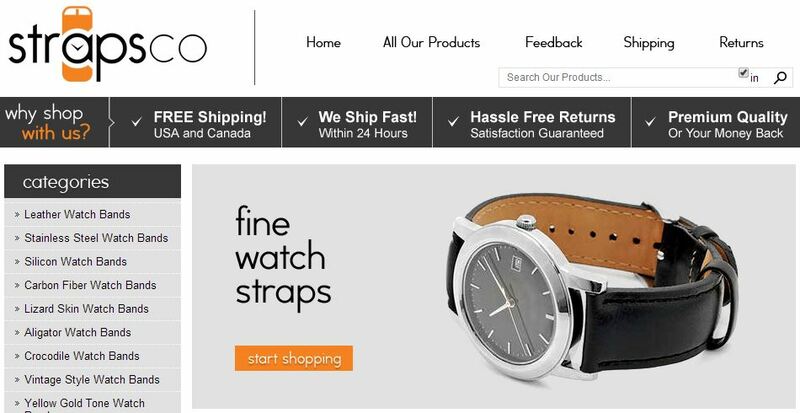 Store categories in the left sidebar clearly spell out a range of choices including watch bands made of steel, silicon, carbon, alligator, and vintage styles among others. 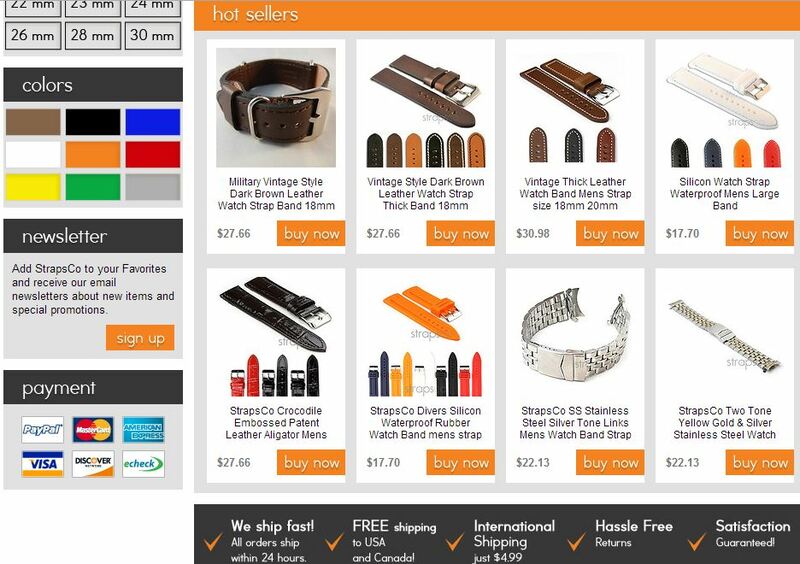 Four of the top store categories are repeated to the right, each underscored with a hi-res image and close up of bands crafted from different materials-a standard with our custom eBay Shop Designs. A sizing chart ranging from 10mm to 30mm makes it easy for buyers to select the proper circumference to fit their wrists. In the midsection, an orange banner of ‘hot sellers’ sets the stage for the individually selected products which appear below. Many come with varying color options and descriptions of the material including waterproof rubber. Listing select inventory in this prime real estate is a great way draw attention to top sellers or seasonal items. Back in the left sidebar of this eBay Template, Straps Company invites it’s most loyal customers to sign up to receive the store newsletter to keep abreast of new items and special promotions. Finally, a grid of payment options with major credit cards, e-check and PayPal logos make it easy for shoppers to safely complete their purchases. OC Designs Online enjoys the challenge of piecing together eBay shop designs with a big presence and even larger inventory. Check out our portfolio for more samples of our work then request a quote. Stay connected to OC Designs Online and check us out on Twitter and follow us on Facebook—be sure to find us on Google+!